Searching for a great lunch in Fraser Heights? Look no further. Last week, I had the intense pleasure of judging Zantac’s Chili Challenge— a Canada-wide competition to unearth our country’s most delicious spicy stew. 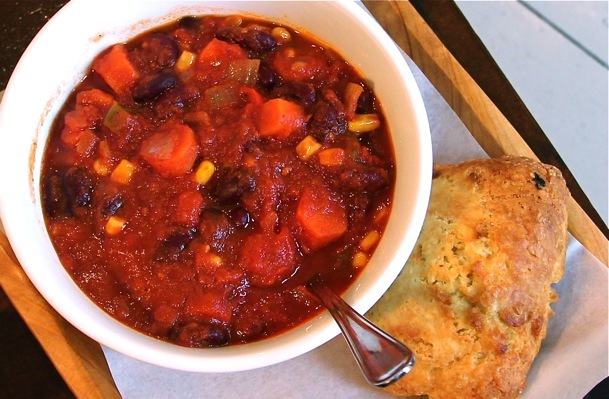 Of course, the hearty event only had me craving more of the down home dish for days to come.At the sight of Vegan Veggie Chili ($5.95) on the menu of Fraser Heights’ new ‘it’ spot — The Outpost Café — I knew I had to have it. A freshly made Butter Biscuit ($2.25) (whose reputation precedes them) was a requisite, as well. Large, al dente chunks of carrot protruding from the meat-free medley’s surface were the focal points. A healthy mix of red kidney beans, corn, onions, and celery in a completely mild tomato sauce finished the bountiful bowl that was more delicious a few hours later at leftover time. Each hot spoonful was enhanced with a small bite of the faintly sweet butter bun. My craving was 100 per cent satisfied.